This is something we made almost eight months ago and I just haven't found the time to post until now. 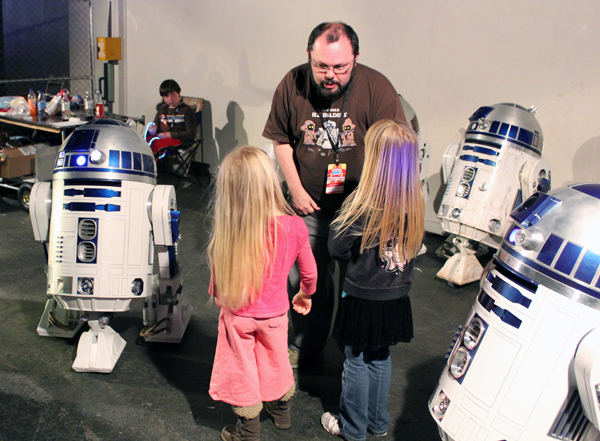 We'd been to the Bay Area Maker Faire back in May 2011 and the kids had had a wonderful time there, the high point of which was hanging out with the Astromech group and all their R2D2 builds. Totally amazing workmanship and engineering! 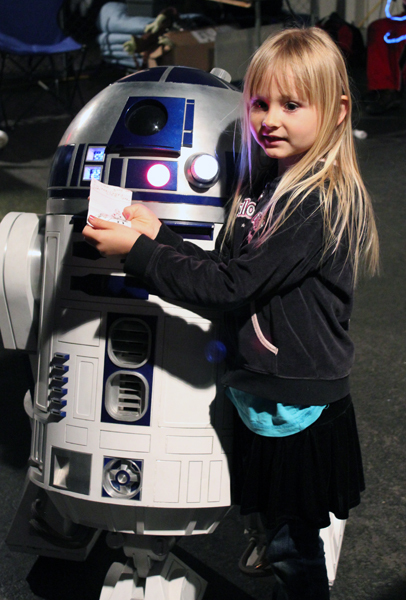 Carys, who is a Star Wars nut, wore her Droid t-shirt especially to go and meet R2 and even drew him a picture. The kids decided that we needed to make our own R2 unit, but making anything even remotely as fabulous as Astromech have done requires rather a lot of cash for parts and a hell of a lot of time dedicated to it as well, so it wasn't going to happen on anywhere approaching that scale (not least because I was a month away from having Delyth). We did put together some baby R2s to play with though, and because they were made from things in the recycling bin and hot glue, the kids got to be involved in the building process. I've photographed the process here so you can also have a go at making them if you want to. 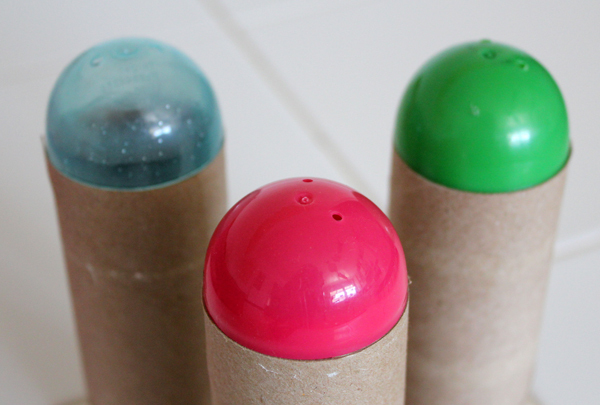 From Left to Right: Ffion's R2, Carys's R2, y R2. 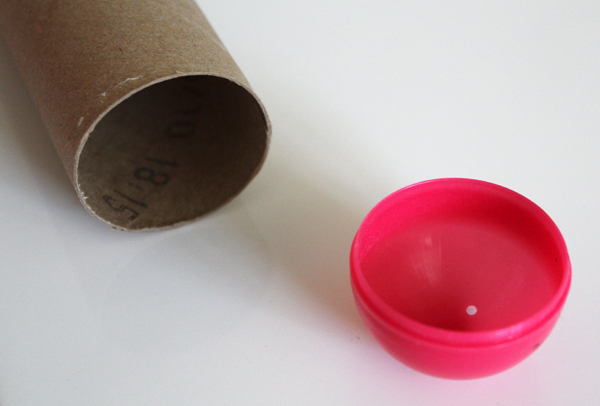 The thing that made me think we could pull this off was noticing that the bottom part of the plastic easter eggs that we'd saved from our egg hunt fitted exactly onto the end of a toilet roll tube, and I mean EXACTLY. It fitted easily on and sort of clicked like it does with the top part of the egg, so it will rotate like R2's dome, but won't fall off, even if you turn it upside down, but you can take it off easily without damaging the tube too, which makes it perfect to be used as a little storage pot. Just look how well they fit together! 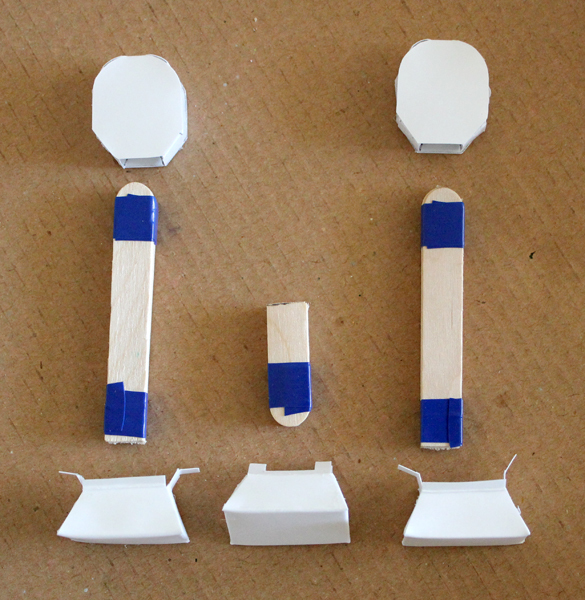 Here are most of the bits we needed to make the three R2s. You actually need six popsicle sticks for each model plus three lots of the print out template that I've linked to later on in this post. First we cut the toilet roll tubes down to be the right height (about 5cm), then snipped lots of little tabs into the bottom of one end so that we could glue the milk bottle lid on. The milk bottle lid had just the right texture along the sides of it to be used for R2's base, but was a little bit too small to be glued in place without making those little tabs and folding them in. 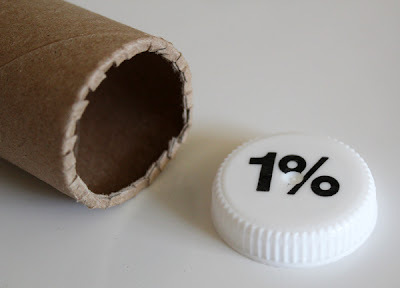 We used hot glue to stick the two pieces together, because it works great for sticking plastic things, and the kids love using the hot glue guns to get immediate results. 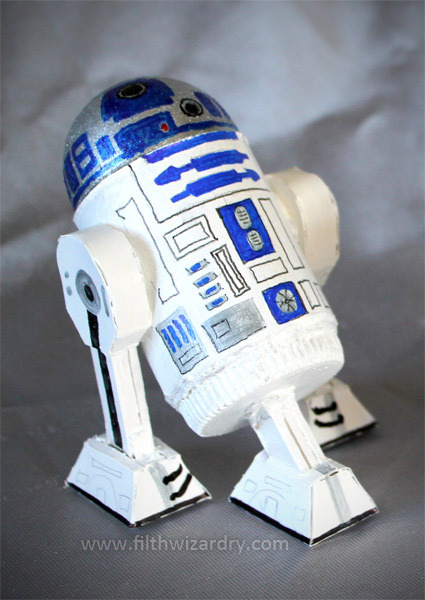 So with the half of the plastic egg popped on top, that's the basic body of your R2 done. Now we had to figure out how to make legs that were going to be the right size and shape, and be sturdy enough to hold R2's body and whatever we stored in it, without falling over or falling apart. There wasn't anything in our box of junk that was going to work for the feet or the tops of his legs. 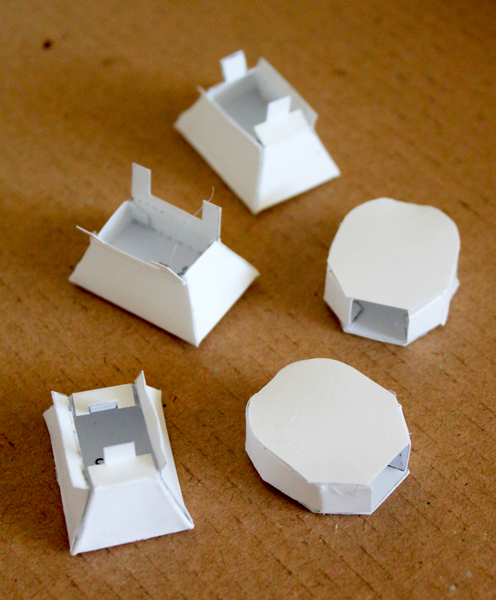 I did think about maybe trying to use the white lids from tick tack boxes, but we didn't have enough of them and it wasn't quite right anyway, so I decided to make little cardboard templates that we could cut out, fold and glue instead. The leg part that makes them sturdy enough is made from cutting down some popsicle sticks with an exacto knife and gluing them together. Generally we try to let our kids have hands on experience with real tools under supervision, but I did the exacto knife part for them. They were only five and six years old when we made these, and even as a grown up I still manage to maim myself with an exacto quite frequently. Maybe I need adult supervision? 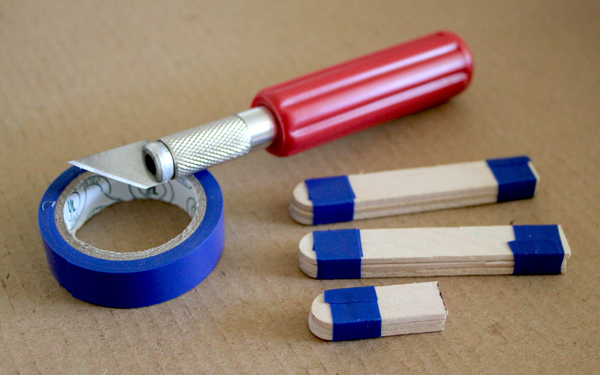 It would look nicer if you glued the popsicle sticks together in sets of three after you've cut them, but we didn't have suitable glue, so we used some electrical tape to hold them together instead. 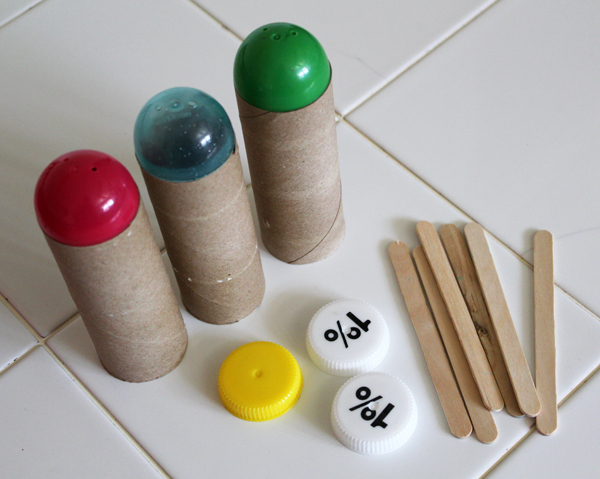 The side legs need the popsicle sticks to be cut to 6.5cm long and the middle one needs to be 3cm. 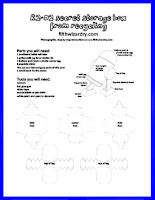 Click here to get the pdf template that I made for the cut out and glue card leg parts. They are rather small, so if your kids are young like mine then you'll likely have to do this bit for them, or at least be an extra pair of hands to hold things in place while they glue. I reckon kids that are nine or ten and older will be able to do this bit just fine on their own though. By the way, the pdf mentions a bead in the list of things you'll need. I was going to use it to glue onto the dome for a realistic thingymadoodle that R2 has poking out on there, but the kids wanted to draw it on with pens, so we didn't bother with that part in the end. Here are the three feet and two shoulder parts from the print out, having been cut out and scored by me, ready to fold and glue. Here they are all folded up and glued together. You can see that the middle foot is slightly different to the other two because the popsicle stick leg goes into it at an angle, rather than straight down like with the two side legs. To fix them onto the popsicle sticks we squeezed hot glue into the feet and shoulder pieces and then pushed the popsicle sticks in, holding them in place until the glue cooled and set, then folded the feet parts closed and glued them shut. 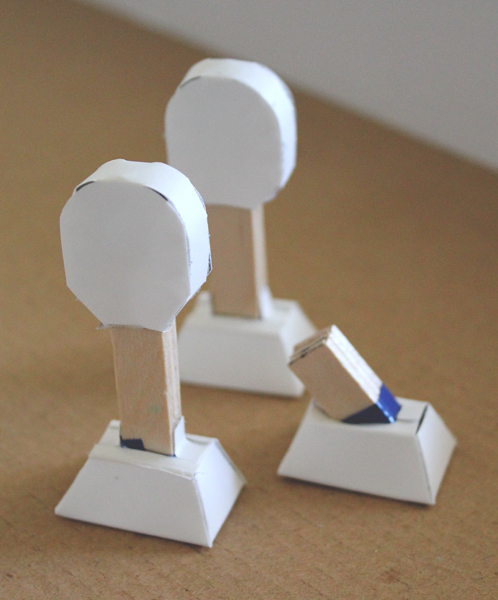 This is how your R2 legs and feet should look, ready to be glued onto the body. 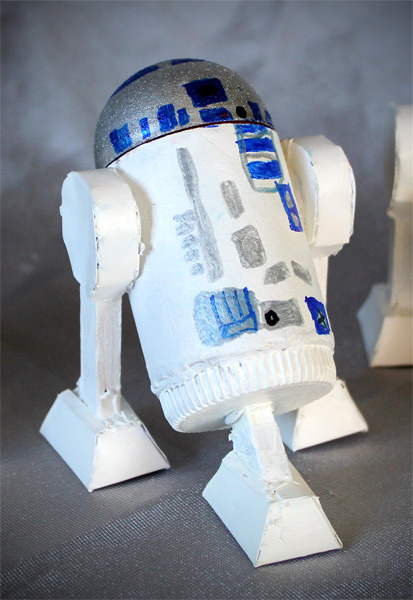 and here is the completed R2, ready to be decorated. We gave the whole of the body a coat of white paint. This would be really easy if you have spray paint, but we didn't, so we just used some white acrylic craft paint to give R2 a plain white base coat. It doesn't look perfect, but R2 is an old droid in the original three movies, so having him look a bit untidy sort of works in the same way that our Wall-E we made out of recycling didn't have to look new either. 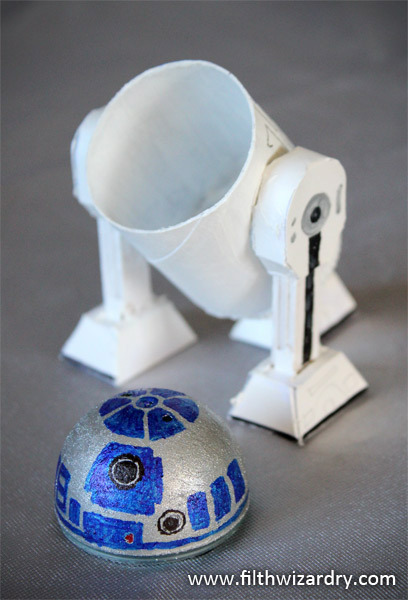 R2's dome is silver, and again, spray paint would have been useful, but what we had at hand was a silver Sharpie pen, so to make that adhere well and not rub off, we sanded the plastic egg part a bit to rough it up, then coloured it in with the pen. 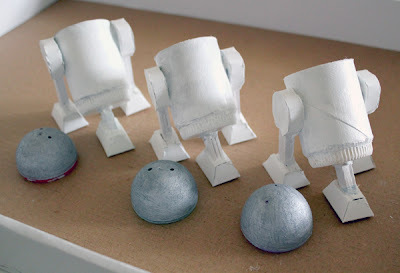 Here are our R2 units all lined up ready to decorate. As far as adding the details went, I just put out a few fine tipped sharpies, one blue, one black, one silver and one red, plus a pencil and everyone used a picture in a book we had as a reference. Yes, I enjoyed decorating my R2D2 as much as the kids did! R2D2 by Ffion, Aged 5. 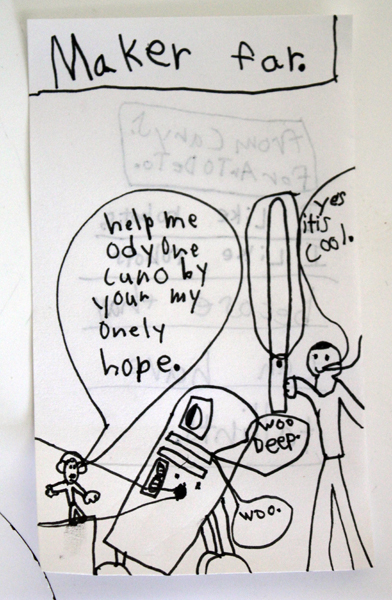 R2D2 by Carys, Aged 6. Hope you enjoyed this post and that, even though it's rather involved, someone out there (whether it be a kid or a grown up) will give this a whirl. I've noticed that the plastic Easter eggs have already started appearing on the shelves at the Dollar Tree! Balloon torch light sabers plus some light painting photography. You're seriously amazing and this is just. YEY! 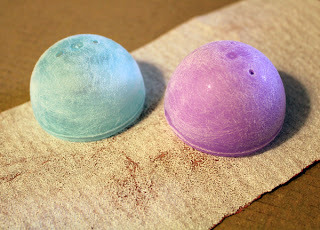 I love these - can't believe they are made out of such ordinary objects. Brilliant. Linds! Speechless! (And yet she will continue to blather on.) I've pinned this so we can make this for the husband. It's brilliant! Eeeek! You are my HERO! The things you crank out of your "junk" box never cease to amaze me. LOVED IT. 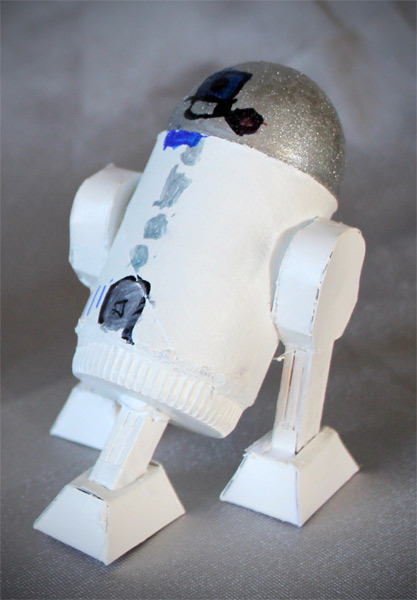 I have a budding little Star Wars groupie at my house that would LOVE to make this. So happy you guys got a kick out of this one :) R2 is such a lovable character and the kids are just drawn to him. We had a hard time getting them to move on from the Astromech area at the Maker Faire, and had to promise to go back later to say bye before we went home! Love love love this! Am pinning it to come back later when I have more time to admire your astonishing creativity! These are fantastic. Thanks for sharing how to make them! Write a book - in volumes, please! An encyclopedic compilation of all things clever, creative, and fun! You are the only mom posting with one original project after the next. So smart - and you apply it to creating with your kids. We're blessed to be reading. Thanks for posting! Looking forward to all this goodness in print! I'm amazed at how you came up with the leg patterns...they fit perfectly, even with imperfect cutting! ;) Staying up late tonight to make 4 more, one for each boy (and husband). Fantastic. Dear "Anon1", Thank you for such big props :) I would like to write a book one day. The idea I have in my head for it isn't something that can be put together quickly though. 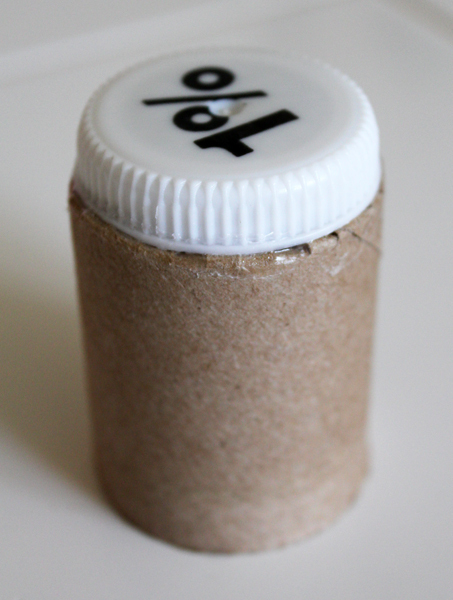 I guess I should just start the process and let it grow slowly just like the blog here. So glad that you're enjoying our projects, even if I do post fairly infrequently. Dear "Anon2", Fabness! I'm so pleased to hear that you've made one and plan to make more! I'd love to show a picture of the ones you've made if you get a chance to snap one before gifting them to your lads :) Glad that you found the template easy to use too! This is so cool! 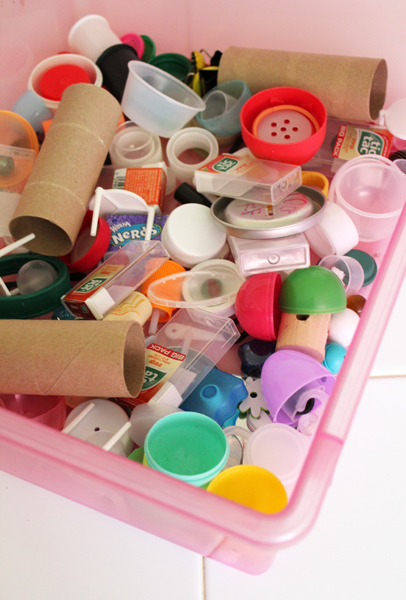 We have a box just like that and all the bits to make this - thanks for the tutorial. Ooh ooh yes, a book please!! 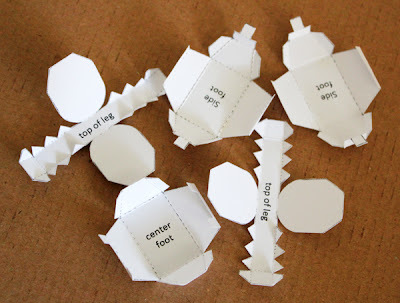 We have one more week of our 6 week summer school hols and this is what we'll be making tomorrow....if I can find the plastic eggs thingys, I know I have some round somewhere...my boys will FLIP over these, and thank you so much for the leg template, they make it perfect! "If you're feeling low down, and you can't find romance, leap into a dustbin and dance!" FABULOUS! I love seeing that there is a new generation of Star Wars loving little girls. Well done you! I just feel the need to say I lovelovelove your blog! Im a sub in some in some of the local prreschools and My sons, six end three, love crafting. This is a goldmine for me. Thank you for sharing all these wonderful ideas! Jolene all the way from Sweden. Simply fantastic!! I adore these, and everything else you do! So glad you posted this! My girls (9,7,5) are in love with Star Wars and they will be so excited to make these! Also, love your junk tub! I kinda collect bits and bobs to maybe use later, but they kinda float around here and there, rather than all corraled in one spot. Why didn't I think of that?!? SWEET!!! 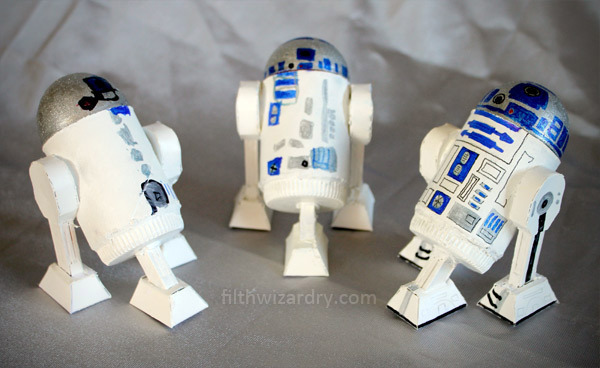 This is, by far, the best construction R2 for kids I have found. I adore your projects!! 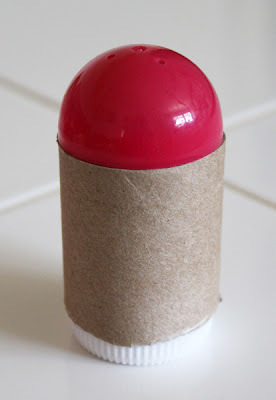 My 4yo also LOVES R2 and has been begging to make one of his own, but I couldn't find anything that he could make (with a bit of help) from our junk/art drawer supplies. He renewed his request for his own R2 when we saw one of the cool R2 units this weekend with its maker (Bob Jacobsen) - http://www.liayf.blogspot.com/2012/02/stand-by-to-fire-ejection-pod.html). Although it won't move around and make sounds, I am sure he will be thrilled! Thank you so much! 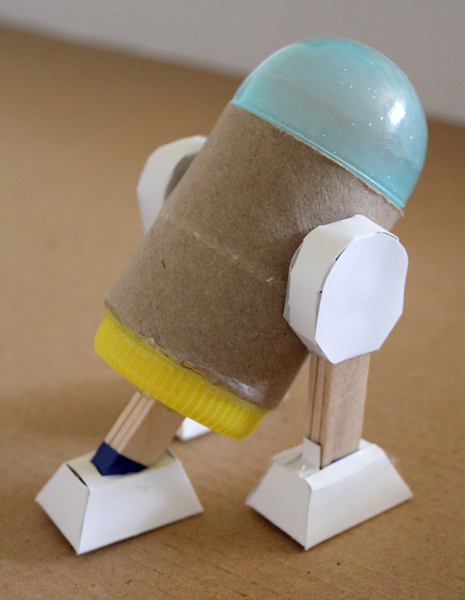 You are making R2D2 models with your kids. This is AMAZING! My boys are both Star Wars FANatics and would love these! We are going to have to make several for their rooms! Thank you! 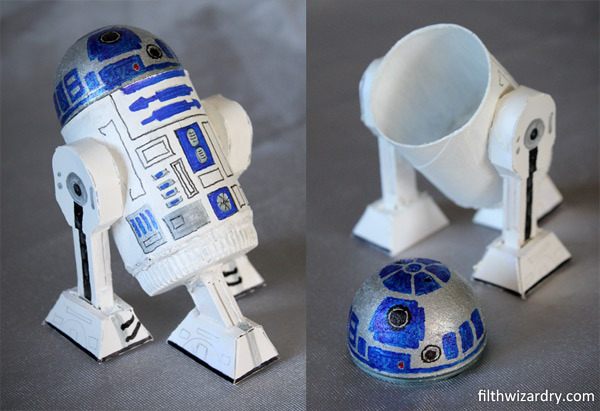 These R2D2 models are so creative and the result is amazingly good, considering that you started with odds and ends from the trash to recycle. I came over from a Pinterest pin on these, now I have to check out what other amazing things you've come up with -- I love your ingenuity! Thanks for sharing your talent and great ideas!